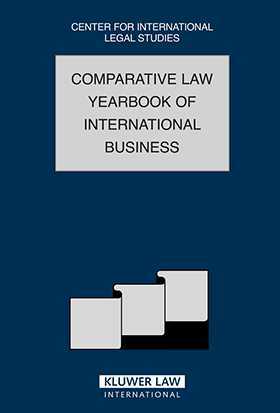 The Comparative Law Yearbook of International Business, in its 2007 edition, treats two major topic areas: litigation and dispute resolution and banking and finance. The litigation and dispute resolution section examines various issues relating to international arbitration, such as the status of non-signatories, the employment of electronic discovery, the use of expert evidence, and costs. It further surveys the recognition of enforcement of foreign judgments in Italy, developments in litigation in Australia, Anton Pilar Orders and Internet defamation, and Italian conflict-of-law rules. The banking and finance section of the Yearbook examines Austrian capital maintenance rules, bank secrecy in Israel, and broker-dealer and investment banking strategies. Miscellaneous articles deal with Mexico’s commercial bankruptcy law, Slovakia’s new bankruptcy legislation, trade marks and the Madrid Protocol, trade mark registration in Hong Kong, franchising in Italy, data protection, Spanish antitrust legislation, and cartel enforcement in Australia. Litigation and Dispute Resolution. 1. Non-Signatories and International Arbitration: Understanding the Paradox. 2. Electronic Discovery and Its Implications for International Arbitration. 3. Challenges in International Arbitration for Non-Signatories. 4. Expert Evidence in International Commercial Arbitration. 5. Arbitration Costs – Advance Payments and Reimbursement. 6. Recognition and Enforcement of Foreign Judgments in Italy. 7. Developments of Litigation in Australia. 8. Obtaining Electronic Evidence in Special Circumstances – Anton Piller Orders in Internet Defamation. 9. Italian Conflict-of-Law Rules. Banking and Finance. 1. Austrian Capital Maintenance Rules – A Challenge for Group Finance Transactions. 2. Bank Secrecy in Israel. 3. International Broker Dealer and Investment Banking Strategies. Miscellaneous. 1. Mexican Commercial Bankruptcy Law in Crossborders Insolvencies. 2. Slovakia’s New Bankruptcy Act. 3. Brazilian Syndicalism and Collective Bargaining: Norms and Dispute Resolution. 4. Trade Marks and the Madrid Protocol – Issues from the United States. 5. Trade Mark Registration in Hong Kong. 6. Franchise Agreements under Italian Law. 7. Data Protection Law in the European Union and the United Kingdom. 8. New Legal Tendencies in Spain’s Antitrust Legislation. 9. Trends and Developments in Public and Private Cartel Enforcement in Australia.